Generalized Analytic Functions is concerned with foundations of the general theory of generalized analytic functions and some applications to problems of differential geometry and theory of shells. Some classes of functions and operators are discussed, along with the reduction of a positive differential quadratic form to the canonical form. Boundary value problems and infinitesimal bendings of surfaces are also considered. 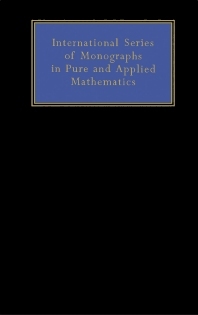 Comprised of six chapters, this volume begins with a detailed treatment of various problems of the general theory of generalized analytic functions as as well as boundary value problems. The reader is introduced to some classes of functions and functional spaces, with emphasis on functions of two independent variables. Subsequent chapters focus on the problem of reducing a positive differential quadratic form to the canonical form; basic properties of solutions of elliptic systems of partial differential equations of the first order, in a two-dimensional domain; and some boundary value problems for an elliptic system of equations of the first order and for an elliptic equation of the second order, in a two-dimensional domain. The final part of the book deals with problems of the theory of surfaces and the membrane theory of shells. This book is intended for students of advanced courses of the mechanico-mathematical faculties, postgraduates, and research workers.